In this tutorial we will see how to read twitter stream using java code. First create a utility class that will help you in creating connection to Twitter but in order to create connection you need to have an account with twitter so if you do not have an account with Twitter go to https://twitter.com/ and create your account. Once account is created go to https://apps.twitter.com/ and create an application with twitter api by clicking on “Create New App” button. You need to provide following information. 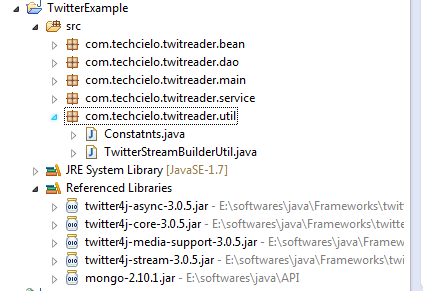 Download API called Twitter4J from following location and add following jars from its lib folder in your Eclipse Java project so following is how your java project will look like. Also when you write this code ensure that you are using OAuth api and not OAuth2 API. Once this class is ready we will use it in our Stream reader class as follows. In our class we are reading all twits that has mention of keywords in String array keywords. While writing this tutorial I have used keywords that are currently trending on BBC news e.g. “Sochi”,”Ukraine”,”Whatsapp”. In this example I have used a bean class to store information retrieved from Twitter feed. Interested user can use it for Producer Consumer implementation ofr using this feed. When your run this code following will be output. You can ignore exception that occurs while your class is not able to connect to twitter and it retries for the same. [Mon Feb 24 12:26:38 IST 2014]Establishing connection. [Mon Feb 24 12:26:48 IST 2014]Connection established. [Mon Feb 24 12:26:48 IST 2014]Receiving status stream. Got twit:RT @MaximEristavi: In Lutsk (Western Ukraine) local riot-policemen on their knees publicly begged ppl for forgiveness. Got twit:A mi nunca me falló whatsapp, lo que me falló fue este pinche mundo. Got twit:RT @JoleenStore: ?? ???? ???? ?? Another blog will show you how to read twitter Stream and send it to different channels in Spring Integration.